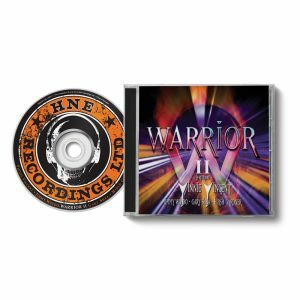 Warrior was the renaming of New England (the band, not the US state, although that would have been interesting) after John Fannon had departed in 1982, and Vinnie (Vincent) Cusano, later to join Kiss, had arrived. We reviewed the first iteration of the Warrior “Lost Tapes” in 2017 (here). In the intervening 2 years, Gary (New England) Shea has unearthered more recordings, including a bunch of (much) better quality demos laid down by the quartet. Some of these songs were on Warrior. Most were not. And it’s two CDs again. Easy observations upfront. First, Cusano was a talented songwriter. Every song, except one, on these 2 CDs was written by Cusano (no wonder he was courted by Kiss). Second, CD1’s 13 songs (presented here as demos and alternate takes) would have made a cracking album if they’d got a label deal and money had been spent in the studio. Third and last, Kiss should never have let him go, he was clearly undervalued. Well, probably fourth, the sheer variety of material here is quite breathtaking. The arrangements are of their time, certainly… this was 1982 after all. Cusano married together his poptastic tunesmithery (a skill he fine tuned as a staff writer on “Happy Days”) with the burgeoning hard rock movement, weaving them seamlessly together into solidly constructed Adult Melodic Rock songs. The expressions of emotion sometimes come from his teenage years (‘Hot Nights’, ‘Baby Oh Why’) and at others there’s a grown up sophistication in the lyrics and the melodies…’No Substitute’, ‘Tears’ (later covered by John Waite) and the beautifully Wetton-esque ‘That Time Of Year’, standout. Thanks to the cutting edge technology brought to bear by Tony Dixon’s Masterpiece Company, there’s depth and detail here, more than you would reasonably expect from mere demos. CD2 opens with the only song across these 2 discs not written by Cusano. ‘Thrill Of The Chase’ was a soulful Jimmy Waldo/Steven Rosen collaboration. It was demo’d well after the band had split, in 1988 to be precise. Cusano had heard it and insisted they get back together to record it. It later found its way onto 2018’s Voices From The Past compilation, performed by Mona Moore. Elsewhere these are “rehearsals with vocals and/or instrumental”. Fascinating stuff, you can hear Cusano leading and coaching the band through his songs, as he lays down an acoustic guitar foundation. The 20 minute ‘That Time Of Year/Forbidden’ is an object lesson in wanting to get it just right. Admitedly, this second CD is one for completists who focus on the machinery of making music as much as the end product. But it’s also a useful adjunct to anyone who’s willing to run with CD1’s high calibre, tightly structured material. In the end no label deal was forthcoming. Cusano, inevitably, went to Kiss and the other 3 went their well documented ways. It’s one of the best (or worst) examples of poor judgement in the history of major label decision making.